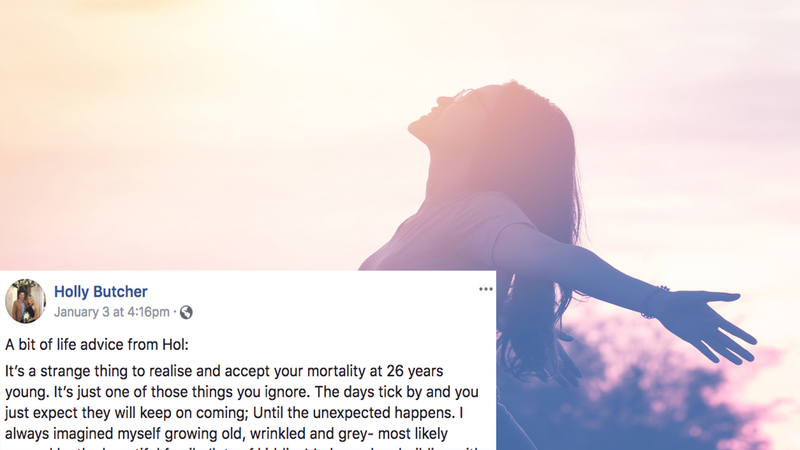 An Australian woman penned a "note before I die" before passing away surrounded by friends and family the following morning at just 27 years old. Holly Butcher died Jan. 4 after a battle with Ewing's sarcoma, a cancer in and around the bones. Butcher's family posted the letter-at her earlier request-to her personal Facebook account. "I'm 27 now," she wrote. "I don't want to go. I love my life. I am happy. I owe that to my loved ones. But the control is out of my hands." As a reminder to not sweat the small stuff, Holly assured you won't be worrying about most of the things you complain about now when you're on your death bed. The post has garnered more than 150,000 shares and 100,000 reactions. "You might have got caught in bad traffic today, or had a bad sleep because your beautiful babies kept you awake, or your hairdresser cut your hair too short." As she closed her message, Holly asked for one more thing - a good deed for humanity: for everyone to donate blood. "Blood donation (more bags than I could keep up with counting) helped keep me alive for an extra year - a year I will be forever grateful that I got to spend it here on Earth with my family, friends and dog. A year I had some of the greatest times of my life."